Nom nom nom. Sticky, sweet, tangy. Nom. Did I mention super cheap too? 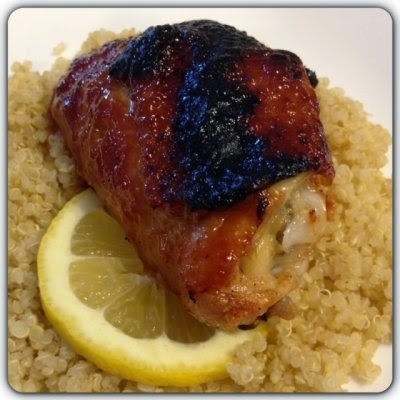 Since we're using chicken thighs, ingredients are cheap, and most of the glaze ingredients can be found in your pantry, this is a cheap, yet tasty dinner! If you're looking to go low-fat you can definitely remove the skin from the chicken thighs...but where's the fun in broiling up that skin to make it nice and crispy? Also, it's an easy dinner to whip up...but it does take some time for the chicken to bake. I can't always bring you tasty, quick AND cheap dinners can I? Preheat oven to 450 degrees, with the rack in upper third. Arrange chicken, skin side down, on a rimmed baking sheet. Bake until deep golden brown and cooked through, approximately 45 minutes, flipping halfway through. Meanwhile, in a medium saucepan, combine 1 tsp salt, juice concentrate, ketchup, brown sugar, vinegar, Worcestershire sauce, and hot sauce. Bring to a simmer and cook until mixture has thickened, approximately 20 minutes. Heat broiler. Transfer chicken to a large bowl, add glaze and toss to coat. Drain off fat from sheet. Return chicken to sheet and broil until sauce is bubbling and chicken is dark brown in spots, approximately 2 min.